With increasing DRAM densities, the performance and energy overheads of refresh operations are increasingly significant. When the system is active, refresh commands render DRAM banks unavailable for increasing periods of time. These refresh operations can interfere with regular memory operations and hurt performance. In addition, when the system is idle, DRAM self-refresh is the dominant source of energy consumption, and it directly impacts battery life and standby time. Prior refresh reduction techniques seek to reduce active-mode auto-refresh energy, reduce self-refresh energy, improve performance, or some combination thereof. 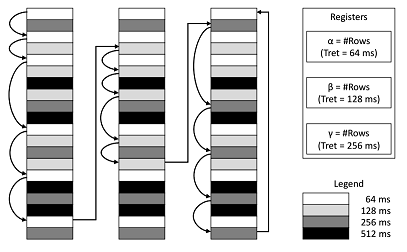 In this paper, we present CLARA, a circular linked-list based refresh architecture which meets all three goals with very low overheads and without sacrificing DRAM capacity. This approach exploits the variation in retention time at a chip granularity as opposed to a DIMM-wide, rank granularity in prior work. CLARA reduces auto- and self-refresh by 86.2%, independent of workload. Auto refresh reduction improves average CPU performance by 3.1% and 6.5% in the normal and extended temperature range, respectively. GPU performance improves by 2.1% on average in the extended temperature range. DRAM idle power during self-refresh is reduced by 44%. The area overhead of CLARA in the DRAM is about 0.085% and negligible in the memory controller.